Recipients of our scholarships, representing San Diego and all of So Cal will compete in an exciting relay race. You can register online to participate and/or donate to the San Diego Event. We’ll have many fun activities, live music, and the parking is free! Food, drink, and SWM gear will be available. For more information, view the Disability Resources Brochure Guide (PDF). OSD works with students with documented disabilities to review documentation and determine reasonable accommodations. Disabilities can occur in these areas: psychological, psychiatric, learning, attention, chronic health, physical, vision, hearing, and acquired brain injuries, and may occur at any time during a student’s college career. We encourage you to contact the OSD as soon as you become aware of a condition that is disabling so that we can work with you. 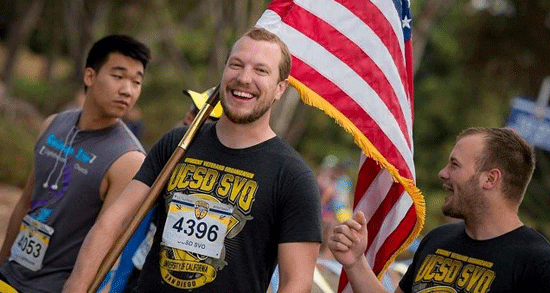 The OSD also serves as a resource to UC San Diego faculty and staff who are providing accommodations to students in classrooms and labs across campus, and we have developed working relationships with other offices on campus to streamline services to students with disabilities. We welcome opportunities to provide disability education to departments and programs, and to develop internal processes that better serve students with disabilities. Finally, the OSD recognizes the unique challenges that some students with disabilities face, including student veterans, as disability impacts all areas of life (physical, mental, academic, and social). We invite you to dialogue with us in a safe, confidential environment, and we look forward to hearing from you.